Does the Skoog work on Windows 7? Yes, the Skoogmusic software works on Windows 7 (both 32 and 64-bit), Vista and XP (SP3). It also works on any Mac from OS 10.4 onwards. Are the coloured Skoog buttons switches? No, rather than pressing a switch and getting the same sound every time, we believe every individual should be able to give their own natural expression to their sound. If you choose to, you can make the Skoog sound different every time you touch it, just by touching it differently. The Skoog is sensitive all over (not just the buttons) and works by transmitting your every touch to an array of analogue sensors within that detect where and how you are touching the Skoog. So, far from being simply on or off, like a switch, the Skoog buttons can be anything in-between, and much more besides. Of course, we had a hunch that some of you might want to use the Skoog as a switch from time-to-time, so we went ahead and made this possible. If you want to do this, simply turn up the sensitivity (all the way up to full) on the side or sides you want to behave like a switch. Is the white part of the Skoog hard/rigid? No, the upper part of the Skoog cube is made from a stressball-like material and is soft and tactile all over. The base support part has a stiffer "trainer sole" consistency, providing stability and a rubber-like tactile feel. Why is my USB extension/hub not working with my Skoog? Sometimes your computer can get overwhelmed by the number of devices connected to it. To make sure your Skoog works with your USB extension/hub, try unplugging other USB devices. 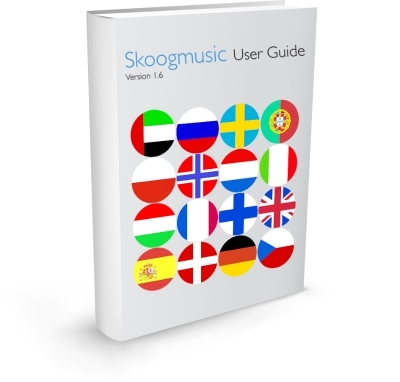 Should you run into any technical problems, first off, take a look at the Skoogmusic User Guide to see if we've already answered your question. We've put a lot of love into it, and it's also available in 16 languages. Check out our helpful Tutorial Videos and FAQs. Still can't find an answer to your question? Ask the experts at the Skoogmusic Forum, email us, or call Skoog HQ on +44 (0)131 554 2838. Does it need to be plugged into the computer at all times? Yes, the Skoog relies on powerful software that runs on the computer. The Skoogmusic software gives the Skoog its ability to be both a truly expressive musical instrument, and allows full user customisation, making it an ideal tool for inclusive music. The Skoog is a rectangular cuboid measuring 15 cm x 15 cm x18 cm (tall) - roughly the size of a 1kg bag of flour - so it has a reasonable physical presence without being overwhelming.